Nothing takes the joy out of your ride faster than sore nether regions. 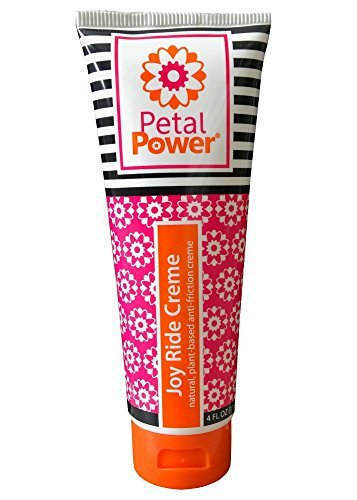 Petal Power joy ride crème chamois cream protects your delicate petals and surrounding areas from painful chafing. Rich plant-based and natural emollients help condition skin and keep it supple, preventing micro-tears, chafing and saddle sores. Unlike many other chamois creams on the market, this mild, plant-based anti-chafe cream contains no tea tree oil, peppermint or menthol so there isn’t any burning or tingling. No petrolatum (petroleum jelly), mineral oil, paraffin wax or other petroleum-based ingredients, so it allows your skin to breathe and won’t damage your clothing. No parabens, no animal-derived ingredients, no animal testing. Gluten-free and vegan. Light, naturally-derived pomegranate scent. Formulated for women, but men use it too! also excellent for any activity where chafing occurs like horseback riding, running, motorcycling, equestrian, triathlon, paddling, hiking, etc. Convenient 4 fluid ounce tub allows you to get the most applications possible. If you have any questions about this product by Petal Power, contact us by completing and submitting the form below. If you are looking for a specif part number, please include it with your message.